My wife said she was having a meeting of the local Archaeology group, in our house, this afternoon so I decided to go carp fishing for the first time this year. I set up my usual simple gear with my spinning rod, braid and a size 6 strong barbless hook tied direct to the end. When we were shopping in the morning I bought a small, uncut loaf. About a third of this (just over 30p's worth) was cut into big cubes and provided more than enough bait for a two hour session. It was overcast but relatively mild when I arrived at the lakes. Since it was my first trip I decided to walk round and have a look at what was going on. Not many other people were fishing but I came across a couple of blokes who were catching bream, rudd and roach on poles and float gear. They said they'd seen no carp. About five minutes later I disturbed some carp in a shallow spot as I walked round - quite encouraging - then I spoke to some blokes who were obviously there for the long haul. Four rods each on buzzers, bivvies and even portable solar panels - what the hell do they do with them? (I began to think that I'm really old and out of touch with modern carp angling). Anyway, undaunted I opted to try twenty minutes spinning for perch with a J9 Rapala - nothing! Then I returned to a snaggy spot between two reed beds where I've had carp in the past. There is usually a massive patch of lilies between the reeds but at this time of year it was more or less clear water. Immediately I saw a decent carp hanging just under the surface about fifteen metres out. More encouragement! I impaled a big cube of crust on the hook, dunked it once and swung it out a few metres to rest across a broken reed. I closed the bale arm and put the rod down on the ground, winding in just enough to keep the line vertical from the crust. Now I waited. - and waited and waited. I knew that there was only a slim chance of a bite so there was little point in shifting the bait about and disturbing any fish in the area. Half-an-hour passed and I'd seen a few reeds shake. For one breathless moment some unseen fish sniffed at my crust causing a little circle of ripples. The heart was beating a bit then - but no! I waited some more thinking that at least the fish knew where my crust was. Time was marching on now. I'm thinking "The visitors may have gone from my house now. Perhaps just another twenty minutes". Another ripple by the bait but no take. Patience Mike! I waited, not even daring to scratch my nose for fear of the movement being detected by a carp. Then, suddenly, "Slurp, slurp!" The crust disappeared and the rod whanged round. I was in! Jeez it was big fish but I had it under control. With heavy pressure I kept it swimming round and round in the open water in front of my stance. It was a whopping linear mirror. By now I've had a good look at it and I'm thinking that it's well in the upper twenties. What a start to the season! The fish keeps making little runs to either side but every time I manage to stop it going too far. Once more it plunges away to my left. It seems to have wrapped the line round a small sunken branch. I can't understand how. No matter what I do I can't shift it. I pick up the net and slide down the bank - risking a ducking and getting thoroughly scratched by the brambles but it will be worth it. Two or three times I have the entire fish over the net but the branch stops me lifting it in. What's wrong. I pull a bit harder being confident of my gear and my knot but then the carp has gone. Bugger!!!!! The line's still hung up somehow??? I poke the net out and manage to snap off the little branch. 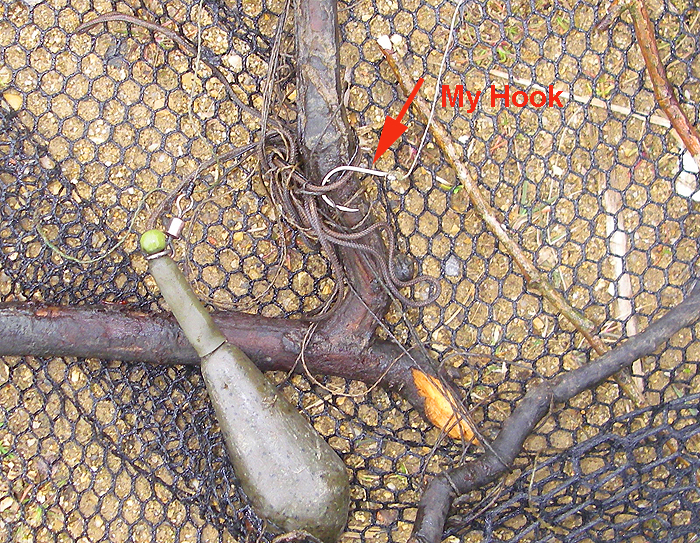 When I reel in I find that my line's not tangled up but the barbless hook is stuck in some line which is wrapped round the twig. The line I'm snagged on is a braided cast strong enough to moor a cruise ship and on it is a ******* great lead bigger than I even use for beach casting (when I do it). I curse the idiots who were using such ridiculous tackle to margin fish in a bloody pond. Ah well! Never mind Mike, time to go for dinner, there'll always be another time to catch one and at least that one escaped unharmed without a hook in it.